During the month of March, Treasury yields decreased across all maturities and the implied credit spread decreased by 4 basis points. Mercer Yield Curve spot rates decreased across all maturities. The dispersion of individual bond yields around the Coupon Regression Curve remain similar to last month. 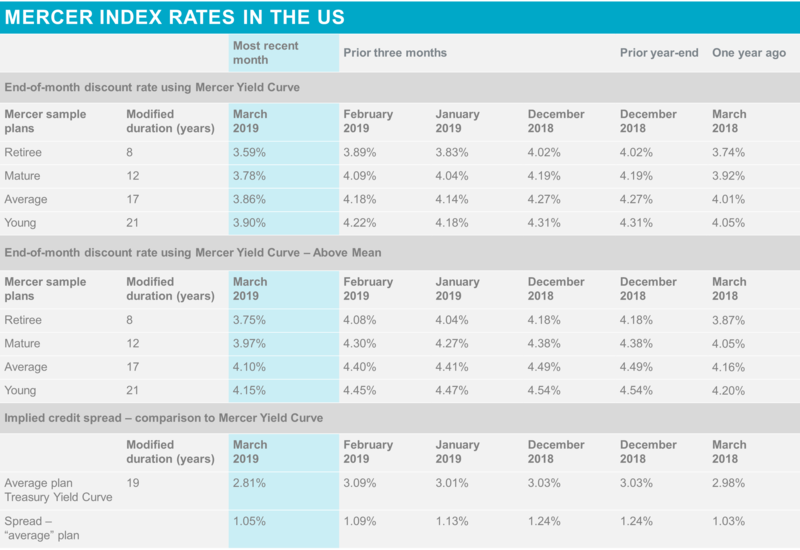 These changes are reflected in the Mercer Index Rates — discount rates for the four Mercer sample pension plans, as determined using the Mercer Yield Curve. For March, the Mercer Index Rates ranged from a decrease of 30 basis points for the Retiree plan to a decrease of 32 basis points for the Average and Young plans. Because both accounting and funding requirements take a market-based view of pension liabilities, financial market movements and linkages become important considerations to plan sponsors as they evaluate their benefit, funding, and investment policies. These linkages and the large changes in both discount rates and asset values over the past few years underscore the need to understand — and manage — how a plan’s net surplus or deficit responds to changing economic conditions. The Mercer Pension Discount Index Rates ("Mercer Index Rates") are created monthly using the Mercer Pension Discount Yield Curve ("Mercer Yield Curve") and four sample retirement plan cash flows. The Mercer Yield Curve is a spot yield curve that can be used as an aid in selecting discount rates under various accounting standards for pension, retiree medical or other post-retirement benefit plans. To determine the discount rate for a plan, each year's projected cash flow is discounted at a spot (zero-coupon) rate appropriate for that maturity; the discount rate is the single equivalent rate that produces the same discounted present value. The chart above illustrates the key elements of the Mercer Yield Curve. To derive the Mercer Yield Curve, we begin with all non-callable and make-whole bonds that are rated Aa by either Moody’s Investors Service or Standard & Poor’s and have at least $250 million of outstanding issue. We eliminate those with very short maturities (less than one-half year) and those that are priced more than two standard errors from the market average. The included bonds are shown as data points above. We then use standard regression techniques to estimate the best-fit relationship between maturity date and yield to maturity (the green line). The Mercer Yield Curve (red line) is then defined as the zero-coupon spot rates that are equivalent to the estimated yields to maturity on coupon-paying bonds. Modified duration (“duration”) is an estimate of the percentage change in the present value of a series of cash flows for a one percentage point change in the discount rate. Thus, if a pension plan has a duration of 15, a one percentage point decrease in the discount rate (from 6% to 5 %, for example) would be expected to increase the value of the benefit obligation by approximately 15%. In certain situations, duration also corresponds to a weighted-average length of the underlying cash flows – hence its frequent denomination in “years.” Comparing the pension plan's duration with that of the plan's fixed-income investments is one tool that can help plan sponsors and fixed income managers assess how well the portfolio responds to changes in the present value of the pension cash flows. Note that duration itself depends on the discount rate and will change somewhat from month to month as the underlying interest rates change. The Mercer sample plans represent four sample sets of projected pension plan cash flows corresponding to typical plans at various stages of maturity: a “young plan” with few or no retirees (duration range 20–22); an “average plan” with a more typical mix of actives and retirees (duration 15–19); a “mature plan” with a high proportion of retirees (duration 10–14); and a “retiree plan” with all or almost all participants retired (duration 7–9). Plan sponsors can use the Index Rates for the Mercer sample plans to estimate what the Mercer Yield Curve would produce for their own plans of similar duration. "Credit spread" is the difference in yield between corporate and Treasury bonds, and is a measure of the market's relative preference for the two types of bonds. We have approximated the credit spread for corporate AA bonds by taking the difference between the discount rate for the average plan using the Mercer Yield Curve and using the Treasury yield curve. Credit spreads for other durations and maturities will differ; credit spreads will also change, as corporate and Treasury bond yields respond differently to underlying economic events. and bonds issued by foreign governments and corporations that are denominated in US dollars. Note, however, in order to be more consistent with international accounting standards, a change has been made to exclude foreign government bonds effective December 31, 2012. In addition to the regular curve, effective November 30, 2012, each month we publish an Above Mean Curve. The Above Mean Curve is constructed from the bonds in the Mercer Yield Curve universe that have a yield higher than the Regression Mean Yield Curve. The Above Mean Curve results in Mercer sample plan rates higher than the comparable sample plan rates produced under the regular Mercer Yield Curve. For March 31, 2019, the difference ranged from 16 basis points for the Retiree plan to 25 basis points for the Young plan.